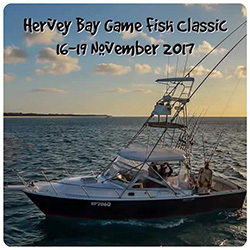 Hervey Bay Game Fishing Club Classic – Hervey Bay, Queensland. 1. G.F.A.A. angling rules apply. 2. Teams: Minimum2, Maximum 5 Anglers. 4. Fishing times are as per program and will be signaled by game fish base. 5. Line classes and points as per score table for 8, 15, 24, 37 and 60kg. 6. A category is available for those fishing “inside” only. Fishing must take place South of latitude 24. 22.000S. and West of longitude 153. 12.000W. Light tackle (8 Kg.) only. Points as per points table except billfish 2000 points & no daily limit on other species. Eligible for inside prize, first and last billfish prizes only. 7. Record fish which are eligible for tag points may be weighed and tag points will be given. Fish which do not come within 10% of the record will receive half points. 8. The first billfish caught each day must be called in after tagging. 9. A maximum of three fish per angler or six fish per team per day other than billfish are to be recorded. No points will be awarded for dead fish unless weighed as per 6 above. 10. Tied scores: if two or more teams or anglers finish with equal points the angler or team reaching the score first will be deemed winner. 11. Fish are considered captured/tagged at the times called in and recorded. 12. Late hook-ups may be played out providing that game fish base is notified prior to stop fishing (see note re Sunday). 13. Protests must be made in writing to the committee before 5.00 pm Sunday. The judge’s decision is final. 14. Boat length is determined by a measurement from the bow to the transom (excluding bow sprits and pods). This measurement will be used to determine under 7.5 metres and 7.5 metres and over. 15. Other fish species may be added to the points list if bad weather occurs. 16. Anglers must supply their own tags. 17. Only NSW Fisheries “billfish only” tags are to be used on billfish. Use of any other tag will disqualify the catch. 18. Weather: Any decision to cancel the tournament will be made by the committee. A strong wind warning will not necessarily stop the tournament. IN ALL CASES SKIPPERS ARE RESPONSIBLE FOR THE SAFETY OF THEIR VESSELS AND CREWS. fish heavy or light tackle and if fishing inside. Changes from heavy to light or vice-versa must be notified to Game Fish base. 20. Radio scheds are 1015hrs, 1315hrs, and 1615hrs daily (No 1615 sched. Sunday). All captures must be reported to game fish base at the next sched. or points will not be awarded for said captures. If out of range scheds must be relayed through another vessel. 21. Bar crossings. All Vessels MUST log on with Marine Rescue Hervey Bay (VHF 22) to report bar crossings and overnight stays and log off on return to Urangan Harbour. 22. No lines are to be in the water prior to start fishing. This includes the catching of bait. Bait may be retained from the previous day. 23. The committee will run random checks to ensure tackle meets GFAA rules. 24. All vessels must have a representative attend the briefing or the entry will not be accepted. 25. All anglers are to receive equal opportunity to fish. Anglers must change after each hookup, and these are to be called into game base to be recorded. The order in which anglers change will be the same as on their entry form. 26. Crew or vessel changes during the tournament can only be made with the express approval of the committee. Thursday 15th Nov: 1100 Hrs. Briefing and Calcutta. Game Fish base to be notified if still fighting a fish after 1300Hrs on Sunday. Must attend weigh in and hand in score sheets by 1700hrs. Potential record fish may be weighed on Friday or Saturday by arrangement with game fish base. Tag cards and score sheets for each day must be placed in the appropriate collection box on the mother-ship by 8.00pm both Friday and Saturday, and handed to a club officer on the Tasman Venture mothership by 5.00pm Sunday. Failure to do so may result in the missing cards being excluded from scoring. Insider prize – see rule 6. Fish weighed in these categories are not eligible for tag points unless meeting point 8 above. Heavy Tackle 15, 24, 37, 60 kg to be fished in over 100m depth only. The mothership will anchor in the Rooney’s Point – Sandy Cape area. The exact location will depend on weather conditions. Mother-shipping must be paid by 5.00 pm on Friday 2nd of November or availability is not guaranteed. Entries not received and paid for by 5.00pm on 2nd of November will attract a late fee of $100.00 per angler. A fuel barge will be available to refuel between 1600hrs and 1900hrs Friday only. .All fuel must be ordered and paid for by 5.00 pm Friday 2nd of November. Fuel prices will be Fraser Island prices (Diesel is $2.30 per litre. Petrol is $2.30 per litre). Refueling location will depend on weather.